Southwestern Gold Inc address, phone, website, and more. Southwestern Gold Inc. in business since 1971, is a full service Company. We are members of the American Numismatic Association as well as many other leading numismatic organizations. 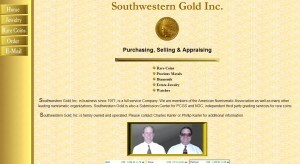 Southwestern Gold is also a Submission Center for PCGS and NGC, independent third party grading services for rare coins.